THE FLOW OF CONSCIOUSNESS: Maharishi Mahesh Yogi on Literature and Language, 1971 to 1976, edited by Rhoda F. Orme-Johnson, Ph.D. and Susan K. Anderson, Ph.D.
For the first time, a selection of talks by Maharishi Mahesh Yogi, the founder of Maharishi University of Management, has been transcribed and published, with this volume on literature and language projected to be the first in a series publishing talks in many different disciplines. In response to MUM faculty talks on art, literature, government, education, and many other disciplines, Maharishi would give his profound insights into that discipline, a direction for research scholars, and a vision of how the study of consciousness would enrich and develop each area of academic inquiry and personal experience. A number of the talks were in response to presentations given at international symposia by leading scholars in their field, Nobel laureates, and such eminent professionals as R. Buckminster Fuller. Over the years, Maharishi Mahesh Yogi recorded brilliant and inspiring lectures on the literary process, as well as critical theory and technique, emphasizing the relevance of the state of consciousness of both writer and reader. He explained how only from an expanded basis can the writer spontaneously experience and express refined emotions and ideas and only from such a basis can the reader hope to understand and enjoy such writings. Literature itself can be a means to evolve one’s consciousness through sounds, rhythms, and meanings, swinging the reader’s attention from concrete to abstract, purifying consciousness and producing bliss. A fully developed consciousness can express the ocean in a drop, and from that drop flows a river of meaning, power, and enjoyment. Immersing oneself in the transcripts of Maharishi’s lectures allows readers to feel his presence, to hear his voice, his rhythms of speech, his humor, and to appreciate his skill as a teacher. His exposition of the power of poetry, particularly the poetry of the Veda, gives the reader a taste of his intellect and his profound understanding of language and literature. It is a journey through a great mind and an exploration of a topic familiar and beloved by all. This volume is a valuable resource to teachers, students, and all readers of literature, to all those interested in higher human development and the literary process. The 350-page book includes 14 talks given in the years 1971–76, and can be purchased at Maharishi University of Management Press (M.U.M. Press). Read the more detailed article in the MUM Review: First-Ever Book of Maharishi’s Lectures Explores Literature and Language. 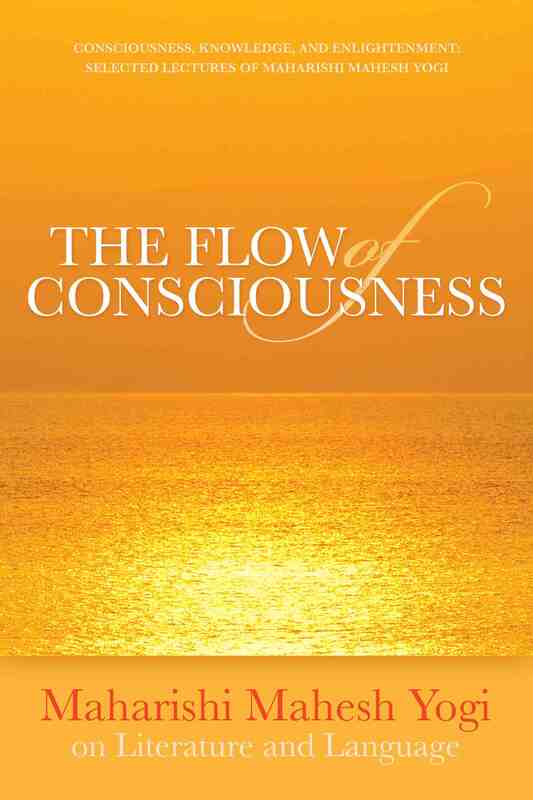 Here’s a comprehensive book review of The Flow of Consciousness: Maharishi Mahesh Yogi on Literature and Language, Edited by Dr Rhoda F Orme-Johnson and Dr Susan K Anderson. Listen to Dr. Rhoda Orme-Johnson interviewed by Dean of Faculty Cathy Gorini.